Harringay will put a spring in your step, and an inch on your waist. For the food, bars and buzz of a great place as yet largely undiscovered by the non-Turkish masses. But mainly for the food. Hectic. Harringay’s Grand Parade on Green Lanes (where every place mentioned here is located) is a street that never sleeps – it’s a blur of neon lights, 24-hour fruit-and-veg shops, young families and professionals, students and the occasional Turkish wedding party. Sounds good. What’s on the menu? There are ten Turkish restaurants doing a roaring trade within less than a mile.Gökyüzü offers the friendliest and most efficient service and, more importantly, the finest meat platter. Antepliler isn’t bad either, especially with its big wood oven in the front for Turkish pizzas. A crop of non-Turkish places has also recently sprung up: Bun & Bar serves burgers and cocktails, while Autograf Grill claims to be ‘probably the best Polish restaurant in London’. Try casual café Mezzo, or the Harringay Sunday market which frequently includes a bánh mì stall. Make a beeline for The Salisbury. It’s staggeringly big and has everything you could wish for in a London pub: a revolving selection of ales, stuffed animals and a roaring fire. Jam in a Jar has a friendly Lower East Side dive vibe and heaves on weekends, when it plays host to Americana-flavoured live music. Time for some sobering retail therapy. There’s an imposing Hawes & Curtis Outlet Store selling heavily discounted threads, and the curious soon-to-open Harringay Local Store, whose window states it is ‘Not another Tesco’. It’s opposite Tesco. But, mostly, Harringay is all about food, so eyes on the prize. Yasar Halim is the best bakery on the block – grab some flaky baklava from there, or a gözleme, a pastry stuffed with spinach, mince, cheese or potato, from the ladies making them in the window of Hala. Now how about a nice sit down? Finsbury Park is but a ten-minute walk away, while down near the Overground station, the surprisingly peaceful Railway Fields nature reserve is also sporadically open to the public for dawn chorus walks and tree-hugging festivals and the like. And if I only do one thing? Sip Turkish black tea with lots of sugar outside Café Lemon and watch the action on the Parade whirl past. By Becky Lucas, who lives on Harringay Road, in Harringay, in the borough of Haringey. The previous resident was called Harry. *Two little edits I’d like to make to this piece. In fact, let’s go for three: 1) If you’re only going to do one thing in Harringay, it should really be eating the mezzes and meat feast at Gökyüzü, rather than sitting outside Café Lemon. I just couldn’t repeat myself. 2) Blend café was edited out of my copy and it is absolutely by FAR The best café on the strip: the perfect place to spend a few hours with your laptop (in fact, I am in Blend as I type this). 3) The picture of The Salisbury included is extremely out of date. A lot of money has been spent making the pub and area surrounding it a lot grander. My piece in The Guardian today about a Dubai sheikh’s hunt for 60 female personal shoppers from Venice. It was the most-read article on the site for a while, with 10,987 Facebook shares at last count. Fantastico! It seemed like an April Fools’ joke. On Tuesday 1 April, news circulated in Italy that a Dubai sheikh had a job opening – in fact, he had 60 of them. The candidate requirements? Applicants must be female, attractive, stylish, aged (or at least look) between 18 and 28, from the province of Venice, able to speak English (French and Arabic a bonus) and, most importantly, possess supremely sharp shopping skills. In return they would be offered €100 (£83) a day and the opportunity to join the sheikh on his European tour next month, where they would attend various high-end dinners and events, stay in luxury accommodation and fly “by private jet only” between Madrid, Paris, London, Stockholm, Ibiza, Milan and Venice. The role itself? To assist his numerous wives and daughters with their shopping. Mauro Belcaro, owner of Italian fashion company Rosy Garbo and casting agency Padua DOC, is in charge of recruitment. He quickly confirms the ad’s legitimacy. “I got a call from an agency in Dubai because we regularly cast fashion models and other roles in the industry,” he says. They wanted Italian women because of “their strong taste in fashion”. Like all good things, the role is rather short-lived: the “shopping shifts” last 15 days, after which 10 new women are installed. On the plus side, Belcaro is in desperate need of English speakers, as this is the language the Emirati women use. “If there are any interested English women living in Italy, or who have lived here before for a year or so, please tell them to apply,” he says. Singing contest Camp Ka Champ (“Champ of the Camp” in English) is like The X Factor except rather than allowing novice singers indulge in a vacuous pop-star fantasy for a few months, years after that boat sailed, it helps impoverished migrant workers in Dubai escape from the daily grind of building one of the world’s most opulent cities at break-neck speed. Instead of Simon Cowell, with his tight t-shirt and eye-rolling theatrics, Dubai-based Indian singer and presenter Shobana Chandramohan plays judge. The format is different too: contestants fight to recognize a tune from its opening chords, then sing, however well, or badly, the remaining lyrics. It’s a chance for every camp employee to show off their singing skills and Bollywood wisdom in front of everyone they live and work with — but only within government-regulated camps where workers have the right residency documents. Understandably, tensions run high in the battle for the Champ stamp and the pressure mounts with every passing year. It was devised by UAE-based advertising agency Right Track to promote clients including Western Union, the company that transfers most of the Indian, Pakistani, Bangladeshi and Nepalese worker’s salaries back to their families. 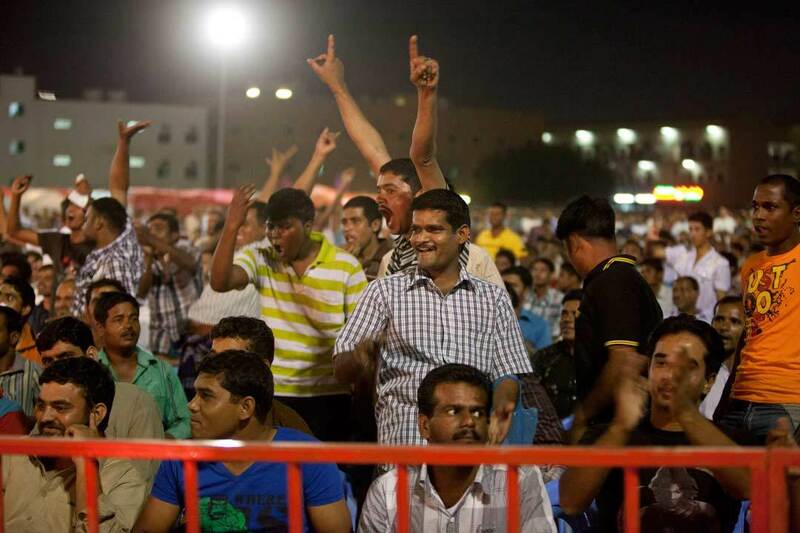 When the competition first hit UAE labor camps in 2008, 30 men entered. In 2013, 3,000 took a chance, with around 10,000 said to have come to watch the final. The prizes, even according to the contestants, aren’t life changing. They are flights home, a bit of cash, flat-screen TVs. You could argue that the champ’s biggest win is the veneration of his campmates. A man currently earning similar respect in film industry camps is Lebanese-born long-term Dubai resident, director Mahmoud Kaabour. After producer Eva Sayre told him about Champ of the Camp during its second year, it quickly dawned on them that the contest could offer a way to get into the camps with a camera — plus permission. Eventually, access was granted and filming of the 2012 contest for the documentary Champ of the Camp began, albeit nervously. “I couldn’t actually understand why I was allowed in,” recalls Mahmoud. Then there is the sensitive issue of filmmaking itself in Dubai, following the much-publicized imprisonment of American expat Shezanne Cassim. Cassim was held on charges of threatening national security last April, after he and some friends posted a satirical short set in the emirate about a made-up martial arts school on YouTube. Following eight months in jail, the UAE deported him in January. Kaabour’s reality-style film therefore follows an objective structure. Dozens of men were initially interviewed at the auditions, but only those who made it furthest in the Champ crusade become the film’s main characters. Knowing they’d be accused of interviewing men handpicked for either their positivity or particularly bleak circumstances, Kaabour is adamant about the documentary’s non-bias. “We gave the voice entirely to the laborers and wanted them to say whatever it is they have to say,” he said. It turns out most workers just want to talk to their wives and children back home. Dozens are filmed singing Bollywood numbers and “ghazal” — classical Indian love songs. Some are comparable to American blues, with somber lyrics about wives and families. It seems the topic uppermost in most of the laborers’ minds is not the work they sweat through during the day, but whatever’s going on wherever they came from. While work contracts are typically at least three years, trips home are made once a year, if that. “Sometimes I talk to my mother on the phone and she tells me to just come home, that they don’t need the money,” says one young man choking back tears. He hasn’t seen his family in three years. He ignores her, as he knows his parents need the Dhs700 ($190) monthly salary they sold their sliver of land in India for, in order to finance their son’s Dubai relocation. While the accommodation appears to be an improvement on that which appalled the world in media reports in 2008 and 2009, even these regulated camps are a shock. Eight workers share a room with little storage or belongings, and dozens share kitchens with no AC, even during the summer’s 110-degree-plus heat. Dhattu says early on that he feels like he’s living “in jail,” though he laughs as he says it. The first uncensored screening of Champ of the Camp took place outdoors in front of more than 1,000 viewers in the shadow of the Burj Khalifa, as part of Dubai International Film Festival (DIFF) in December. It is said to have triggered tears, so moved were the city’s relatively more affluent types to hear first-hand of the harsh realities of thousands of men living right next to them. Five of the laborers from the film were invited to a podium to sing immediately afterwards — they were met by a standing ovation. But he’s still holding out for a little more love at home. “As we made the film, no one wanted to be seen as 100 percent siding with it. Even DIFF gave their budget to films over the Arab world other than ours. But when they saw it, they ended up throwing this huge (premiere). I think now, with the public support for the film, there’s going to be more backing,” the director said. The latest Human Rights Watch report on the UAE outlines the continuing injustices for Dubai’s hundreds of thousands of migrant construction workers. There’s still no minimum wage. Some working environments have been deemed unsafe. Employers are said to continue to hold too much power over their workforce, while recruitment companies allegedly still illegally charge extortionate visa fees. Obviously none of this can be tackled head on in a government-approved documentary. But the fact that Champ of the Camp gives a handful of Dubai’s sea of anonymous, overall-clad workers some depth and dignity — and that it can be shown inside the UAE — is a start. The fact Simon Cowell is nowhere to be seen is just a bonus. An article for The Telegraph about the trials and tribulations of settling back into London living after seven years away. Has the city gone mad, or have I? It’s just over four months since I moved home. Following seven years in Dubai, I uprooted my comfortable, sunshine-filled expat life, packed it into boxes and sent if off on a ship back to London. It was time to move back, be nearer my family and oldest friends and put an end to the constant limbo that hangs over one in a place so endlessly transient. Once I had, I found I’d inherited a new and somewhat strange skill: the ability to look at my own country through sparklingly clear eyes. UK life differs sharply from that in the UAE, and there have been extra, unexpected difficulties involved in repatriating myself. My personal speed and space boundaries had to be recalibrated first. London’s faster tempo was thrust upon me as soon as I touched ground, as hundreds of my fellow passengers marched off the plane and near-sprinted to border control. For once I couldn’t overtake everyone; I struggled to even keep up. Clearly, living in a city of merely 2.1 million had readjusted my pace and parameters. But it isn’t just the fact I’ve come from somewhere less densely inhabited that makes me feel like London is overflowing. It’s because it is: back in 2006 the population here was 7.5 million – now it’s 8.3. The presence and pressure of those extra 800,000 residents is palpable. Next up: my immune system needed a service. The minute the freakishly long summer ended (the best in seven years – talk about good timing), and I stepped into an office, I got a cold, cough, eye infection and my wisdom teeth flared up – all previous health issues that had laid dormant for years. My body had gone soft, incapable of dealing with temperatures less than 25 degrees, or an office without air conditioning or a fleet of housekeeping staff. Thankfully, it only took my white blood cells a fortnight to catch up with me – which was almost as quick as HM Revenue and Customs. But not everything has been a stinging slap-in-the-face sort of surprise. On the whole, it’s been a process of realising how much I’ve truly missed, without realising. By now my phone is stuffed with scenery shots: green fields, glistening lakes, pink sunsets, purple heather. The British countryside is stunning – it just took me seven years in an arid desert to notice. The smell of grass, the scattering leaves, the clearer light are all magical, truly. All that lush life feels so soothing and rehydrating for my wandering soul. Similarly cheering has been my readjustment to London city life. At first, I’ll be honest, I felt frightened just walking down the street. I jumped out of my skin when a salesman asked if he could bother me for a moment. “No!” I impulse-barked at his raised eyebrows. Dubai doesn’t have much of a pedestrian culture; you hop in a cab to go anywhere, even cross the road at times, so you don’t actually come close to crowds of other human beings as often as here. The UAE is also, comparatively, an incredibly safe place to live. Case in point: I once lost my debit card in a club, only to discover that a stranger had found it and cancelled it for me. So, initially, I felt like rather a babe in the wood walking about Hackney and Camden; as though I had “newcomer” etched in my eyes and “Dubai savings” on the watch on my wrist. But time and time again I’ve been uplifted by the kindness of strangers: the man who lifted my stupidly heavy suitcase up three flights of stairs at Highbury and Islington station; the taxi driver who stopped the meter after a lengthy road diversion, then drove on and made sure I got safely to my front door; the older lady who shared my pain as we waited for an hour at Turnpike Lane for that mystical “replacement bus” one Sunday afternoon. Don’t get me started on my reacquaintance with cancelled/delayed/disappearing tubes, trains and buses: why can’t engineering works be done overnight when all motion stops anyway? But yes, I’m happy to tell you, London remains, essentially, a friendly place. And that’s even amid the high street loons, like Kentish Town’s Cardboard Box Head Man, Lady Who Paints Her Face Bright Red and Man Who Wears Clown Make-Up. Honest. Yes, no doubt these cultural jolts will keep on striking as I immerse myself back fully into the swing of British life – until they suddenly, imperceptibly, stop. For now? I’m just marvelling at them as they hit. It’s a zoo out there: quite literally in the case of Dubai. Last week, one of the city’s nightclub-goers took a monkey to a club and – from the looks of one photograph – tried to get it drunk on vodka. The small animal, wrapped around a man’s sizeable waist, made it past front-of-house staff at the five-month-old Vanity club long enough to be snapped in several photos, before being swiftly ejected and barred – along with its chaperone and his other, human, guests. Shortly after, images of the monkey’s night out appeared on Facebook, apparently sporting the logo of the club night’s independent promoter. The resulting furore ran on Facebook and Twitter for days. But the big question is why this incident has come as such a shock to Dubai’s system. Monkeys are regularly seen around town. I am a former United Arab Emirates resident myself, and I once witnessed a shivering monkey, clothed in a baby’s nappy, being held out of a car window before a papping crowd. I was also once invited to see some tigers that were kept in the office HQ of a large well-known company. I declined, although a friend who was working with the business saw the captive big cats first-hand. The sightings and stories are endless. In 2012, a shot of a tiger peering out of a car caused a minor Twitter storm. A cheetah on a lead was seen in 2011, and another was found dead in Al Ain in 2012 after escaping from a cage in a private villa, while a baboon made a break for it the same year. So exactly how difficult is it to adopt an exotic pet in the UAE? A quick search leads to multiple sites offering marmoset monkeys and, among others, cheetah, tiger, leopard, cougar and jaguar cubs. An hour later, I’ve been emailed details of a 10-week-old cheetah cub I can welcome into my family from Cameroon for $1,700 (£1,042) – no questions regarding my prior cat-handling experience asked. Gulf News, one of the UAE’s most-read newspapers, achieved a similar feat last year, showing that it was possible to acquire a black-market baby crocodile for less than £200 (the trader warned them to “take care” if it “grew big”). In February 2013, it became illegal to import such animals into the UAE, but captive breeding is not so tightly regulated. The offending clubber has unwittingly increased support for Dubai’s fight against exotic pet ownership, and brought better regulation one step closer. Which makes for a fairly uplifting answer to the question: what happens when you get a monkey drunk?